With the world reeling and global markets reacting to U.S. President Donald Trump's new travel ban, University of Toronto faculty and students are tapping into their expertise to find fitting responses. In a statement released Jan. 31, Iacobucci said the Faculty of Law is working on a number of initiatives in response to the ban. On Feb. 3, the Office of the Provost posted a memo highlighting information and resources for students, faculty and staff across the university – including examples of ways members of the U of T community could help, such as consideration of late applications for admissions and hosting events at U of T previously scheduled for the U.S.
Iacobucci said the Faculty of Law had learned of a planned conference at Columbia University in March that was to involve Yemeni scholars now banned from travel to the U.S. The department of political science in the Faculty of Arts & Science also issued a statement “categorically” condemning Trump's executive order and calling for action by such groups as the Canadian Political Science Association, the International Studies Association and the American Political Science Association. “We would hope that political science associations with conferences or meetings scheduled in the United States will consider moving locations, or at the very least, creating participatory opportunities for those who cannot, or do not want to, travel to the United States while this executive order is in effect at the very least, creating participatory opportunities for those who cannot, or do not want to, travel to the United States while this executive order is in effect,” the statement said. Individual faculty members and researchers from across the university are also taking a stand. U of T Engineering Professor Peter Robert Herman found himself staging a brief but very personal protest at an academic conference in San Francisco. 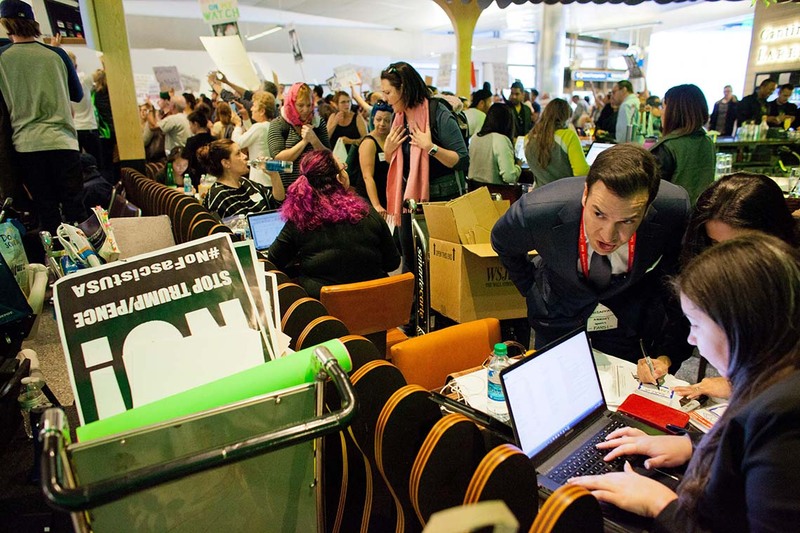 Herman's PhD student, Ehsan Alimohammadian, was detained for 14 hours in San Francisco International Airport on the weekend and denied entry to present his research at the conference. With his student sent back to Canada, Herman presented the research instead, taking a few minutes to express his opposition to the policy. Read more about the PhD student denied entry to the U.S. Associate Professor Emily Gilbert, of the departments of geography and planning and Canadian studies in the Faculty of Arts & Science, is an expert in borders, Canada-U.S. relations, immigration and mobility. Gilbert had weighed in on Trump's first week in office – but that was before he signed the executive order for the travel ban. Over the weekend, President Meric Gertler spoke out against the executive order. “The strength of research and teaching at the University of Toronto has always been based upon our ability to welcome the most talented individuals from around the world, and the freedom of our faculty and students to travel abroad for purposes of scholarship and study," Gertler said. “Actions that impede this would be terribly harmful to our academic community, and to Canadian research and scholarship more broadly. Emerging scholars at the university are also offering analysis, with op-eds calling on Canada to do more. Simon Frankel Pratt and Craig Damian Smith, PhD candidates in political science wrote an op-ed in the Toronto Star, saying that by banning refugees, and specifically targeting Muslims, Trump has made the United States a security liability. Pratt researches counterterrorism, intelligence and national/international security. Smith researches the connections between irregular migration systems and regional security. Lama Mourad, another PhD candidate in political science, also wrote an op-ed for the Toronto Star, tapping into her own personal experiences as a child of refugees and her research into how Lebanon has responded to the Syrian refugee crisis, to call on Trudeau to repeal the Safe Third Country Agreement with the U.S.
Read: Trudeau should repeal refugee agreement with U.S.
Gilbert is also calling for the rescinding of both the Safe Third Country Agreement and the Designated Country of Origin status. “The United States can no longer be considered a safe country,” Gilbert said. “We need to make it easier for vulnerable peoples in the United States to seek refuge in Canada. In his statement, the Faculty of Law's Iacobucci said people are continuing to engage in “in ways small and large” in efforts related to the travel ban.